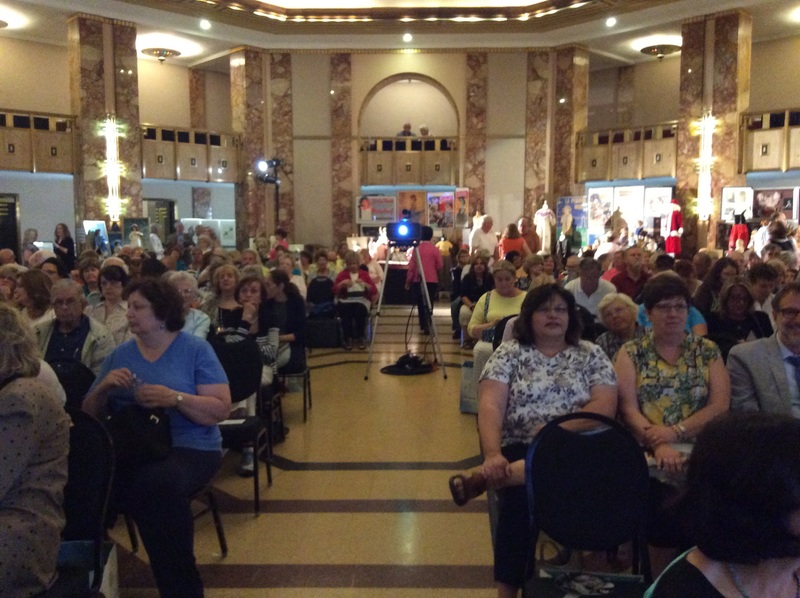 At the 66th annual United Federation of Doll Clubs National Convention in Kansas City I have had no trouble staying busy. In fact, the exact opposite has been true. The “A Dream Come True convention officially began yesterday, and I have spent the last two days in a whirlwind of seminars, tours, meetings, exhibits, salesroom openings, and much more. To summarize Theriault’s Love, Shirley Temple event, all I can say is that it was fun, exciting, exhausting, and very different from any other doll auction I had ever been to. 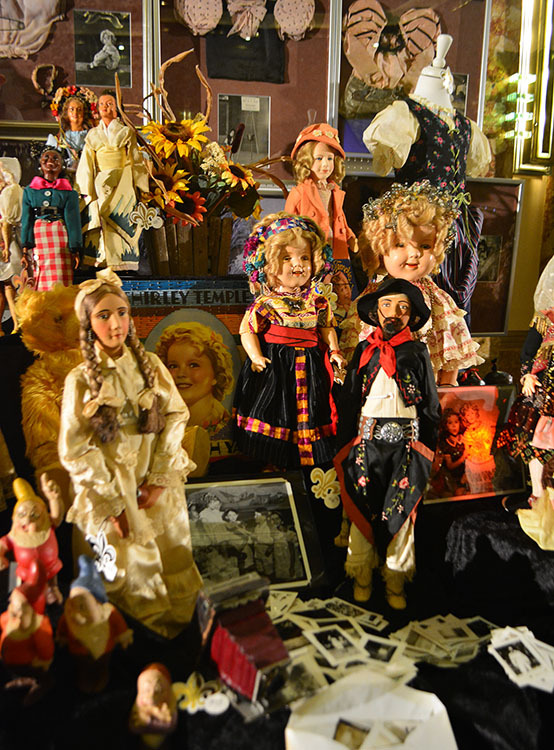 There was a tremendous outpouring of love and nostalgia for Shirley, and a great desire by many collectors to own a doll, costume piece of artwork….something…anything…that Shirley owned. Hence, prices for the entire auction were very strong, usually many times over the pre-auction estimate. 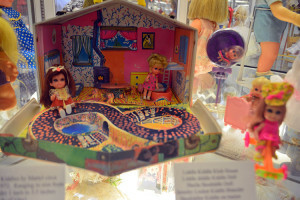 Besides the movie costumes, the most popular items seemed to be any doll or toy that was accompanied by a photograph of Shirley holding said doll or toy. And people were willing to pay a big premium to own one of these items. 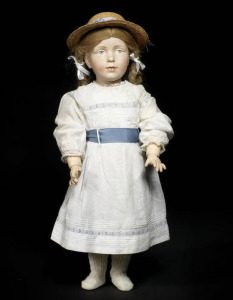 I swear I saw an Armand Marseille 390 sell for over $4,000–but it came with a fabulous picture of Shirley Temple holding the very same doll. The auction continues! 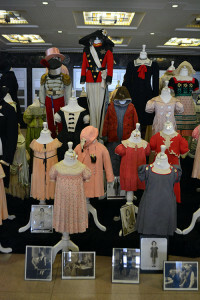 Prices are generally high, especially for dolls and toys which have a photo of Shirley with the doll or toy, one of a kind Shirley Temple dolls in costumes made by the studio for Shirley, and of course the original costumes worn in Shirley’s movies. That said, there are still some items going at or below estimate. My only concern is how long this auction is going to take. We are at lot 110, and that has taken nearly 4 hours. So if my math is correct and the pace doesn’t pick up, we’ll be done here in no less than 16 hours…so 5am? In any case, lot 86, a Shirley Temple doll in her Scottie Dog costume from Our Little Girl, with a vintage photo of Shirley with the doll, sold for $16,000 against a $1,000 estimate. I wonder if that is a record price for a Shirley Temple doll? If anyone knows definitively, please let me know. 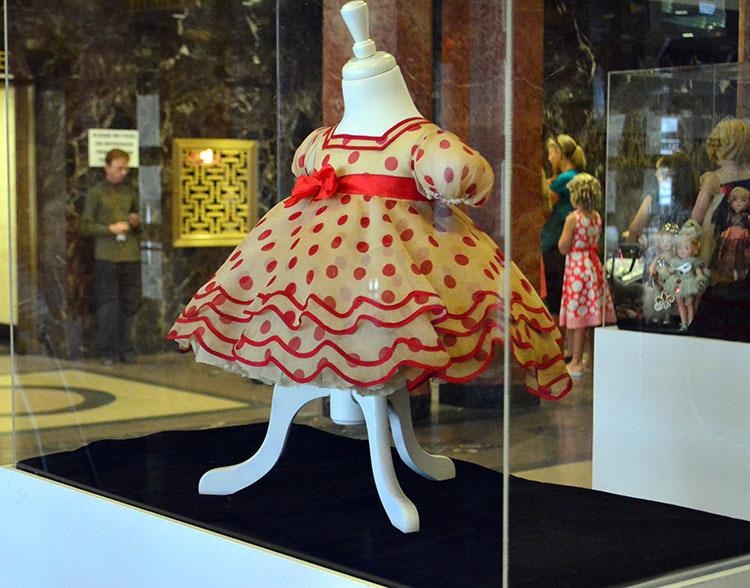 The iconic red and white polka dot dress from Stand Up and Cheer, from the “Baby Take A Bow” star-making number sold for $75,000 against a $20,000 estimate. It was purchased by a museum in California. The Good Ship Lollipop dress is next! They are playing the clip now and people are singing along! UPDATE: The Good Ship Lollipop dress just sold for $21,000 and was sold to the same Californian museum. 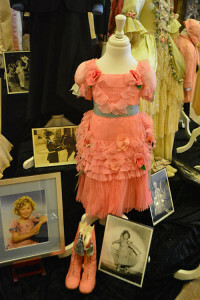 The Theriault’s Shirley Temple auction is about to begin! Florence Theriault has told me she believes this is the largest attendance ever at a Theriault’s auction! Stuart Holbrook has given a talk about the museum tour, and all the people and emotions that entailed, and also about Shirley’s legacy as told through these items. I’ll have reports on prices and more later, and remenber you can follow along at Proxibid. Oh, and the very first lot, Shirley’s Volland Raggedy Ann, went for $11,500 against a $1,000 estimate. 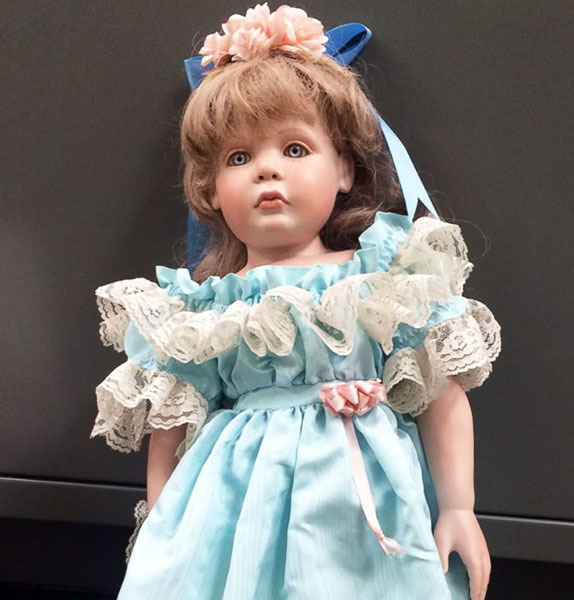 Out of all the doll stories I’ve covered over the years, I think that Theriault’s Shirley Temple auction has generated the most widespread positive coverage. 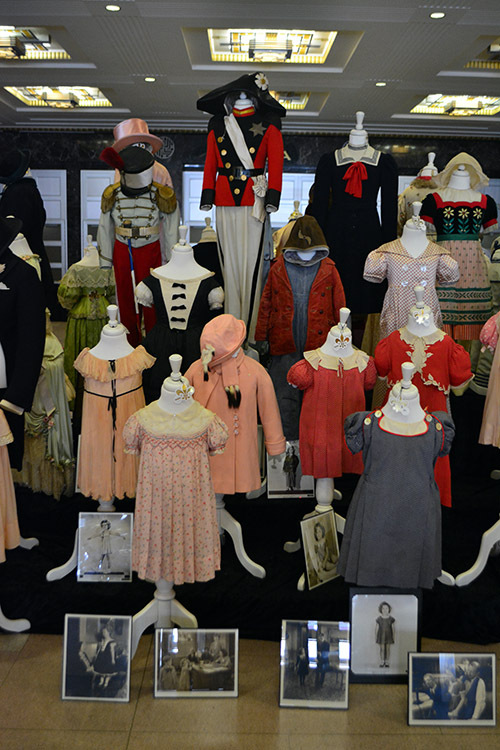 Media coverage of course followed the exhibit as it traveled around the country to locations including the Strong Museum in Rochester, the Wenham Museum in Massachusetts and the Santa Monica History Museum in California. However, in the last few days coverage has really snowballed, and has included articles in the Daily Mail (A piece of Hollywood history: Child actress Shirley Temple’s most prized possessions, including toys, film costumes and a $30,000 baby grand piano, to go up for auction) and the Guardian (Shirley Temple’s Belongings Set For Auction in Kansas City) in the United Kingdom, as well as articles in well-known United States publications including Vanity Fair and the Hollywood Reporter. 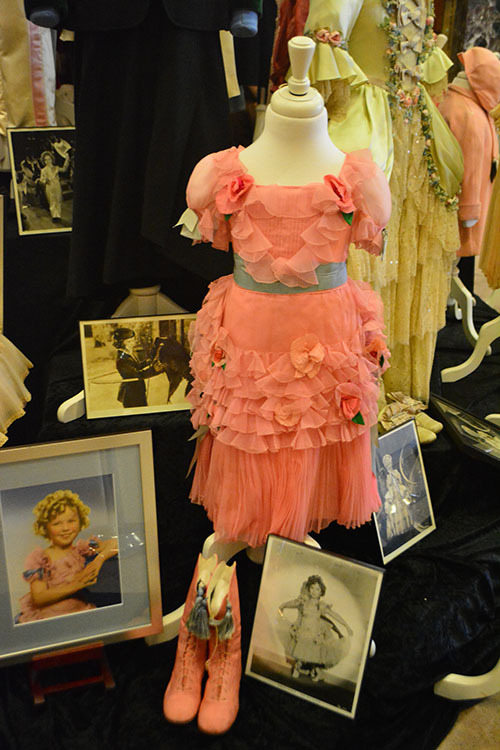 And, of course, local Kansas City media is covering the auction, including the Kansas City Star: Shirley Temple’s Memorabilia Auction May Rack Up High Dollars in KC. In any event, I’m enjoying the coverage quite a bit more than the usual mainstream media doll coverage, which too often is along the lines of Why Does The Media Insist On Calling Porcelain Dolls Creepy? I’m in Kansas City all week, and will be blogging the Theriault’s Love, Shirley Temple exhibit and auction, and then later in the week, A Dream Come True, the 66th Annual UFDC Convention. Its been awhile since I have been to any doll-related events, and I couldn’t have picked a better duo of events to attend! 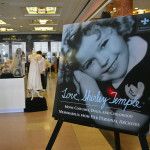 I just got back from Theriault’s exhibit of the Shirley Temple collection at the Little Theater, just across the plaza from the Kansas City Marriott Downtown, the convention hotel. 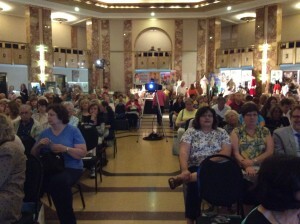 The exhibit is fantastic, and the theater is an absolutely fantastic setting. I have tons of photos that I’ll be sharing in additional posts tonight, and I’ll be at the auction tomorrow with all the news from this exciting event. On Wednesday convention registration starts, so I’ll start to have convention news then. The convention runs through Sunday. 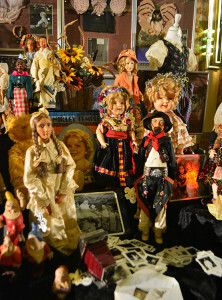 On Wednesday I’ll also be attending Theriault’s antique doll auction, Among Friends, the Billie and Paige Welker collection. Look for daily updates! This year has been an exciting year for antique doll collectors, with the first dolls ever to break the $300,000 price barrier at auctions. In fact, a new world’s record was just set for the most expensive doll ever sold at auction, but you probably haven’t heard about it, since lately the mainstream media is only interested in reporting about scary dolls, or dolls in horror movies like Annabelle. However, thanks to my son’s roommate at Wesleyan University who is a collector following Artnet News, I found out early this week about the new record for the most expensive doll ever sold at auction. 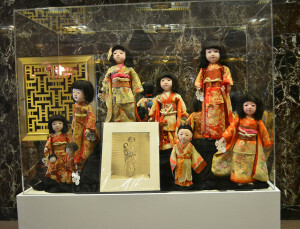 The new world record-setting doll was sold at Bonham”s on September 24 for £242,500, which is approximately $394,000. The doll is a German character doll by Kammer & Reinhardt. It has an unknown mold number which has been speculated to be an experimental mold. Until the sale of this doll, the world record for highest price for a doll sold at auction was held by Theriault’s for the sale of a French character doll by Albert Marque which sold in March of this year. That doll was from the Puppenmuseum Stein am Rhein, a doll museum in Switzerland, and was #27 of the 100 examples of that doll known to have been made. 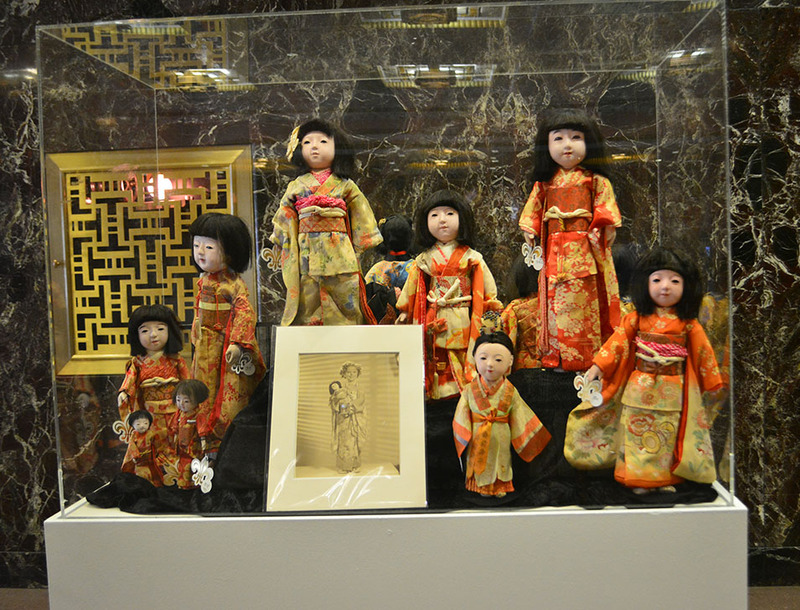 That doll sold for $300,000.